It’s important to start with the fact that climbing, both indoors and outdoors, routes and bouldering, is statistically very safe when compared to traditional contact sports played by children (and far safer than getting into the car). Reading The British Mountaineering Council’s “Young People: Climbing, Hill-walking, Mountaineering, A Parents Guide” is a worthwhile 5 minutes for anyone wanting a succinct introduction to the nature, benefits and potential risks of our sport (link below). I have to say it is very rare for me to see anyone under 18 in my practice, because unlike us older folk, they are far more focussed on having fun than training, and are usually lighter, fitter and generally bouncier. The main issues and injuries that I see with adult climbers are usually related to over-training, and only very occasionally trauma, for example from landing awkwardly on a bouldering mat. However, climbing is great fun, and can be a competitive sport, and it is only natural that keen youngsters will want to train hard, improve fast and challenge themselves. These higher-performing kids can also sustain over-use injuries through incorrect technique and inappropriate training methods, which is why I wanted to write this article to highlight key areas of understanding that will help our budding athletes stay injury-free. First and foremost, climbing is a skill-based sport. You only have to watch a gym-sculpted novice try an overhang for the first time to realise that strength and power don’t help if you have no technique. Some research done in 2008 showed that the very best climbers in the world actually pull less hard on holds and spend less time hanging from each hold, supporting the notion that having fluid, efficient movement with excellent transfer of weight on to your feet is the most important factor in climbing performance. It takes thousands of hours practicing a skill to fully incorporate it into our sub-conscious movement patterns and attain an ‘expert’ level, so to become a seriously great climber, you need to climb lots! There are parallels to draw between gymnastics and climbing, in that it is skill based but requires serious strength and power. The professional Team GB gymnasts that I work with train 26 hours per week, put the vast majority is skill based, spreading out aspects of power and shock absorption to allow adequate recovery and prevent injury. Applying this to climbing, climb lots, but to prevent over-training, sessions should be skill and movement focussed rather that centred around particularly powerful moves or viciously tiny holds, and crucially a climber should finish with a little energy left in the tank. Training to complete fatigue is actually detrimental to technique, increases injury risk and means you will need to rest longer before you can train optimally, which in the end adds up to less total climbing. Many serious adult climbers perform strength and power training exercises alongside their climbing activities, using specialist equipment such as campus boards, fingerboards, gymnastic rings and weights belts to augment their climbing training. It is easy for youngsters to see this and think that it needs to form part of their training too. However, a growing child’s body is very different to an adult’s. Their bones are still growing, and where their tendons insert into bone the structures are softer and less durable than in adults, particularly during periods of rapid growth. Damage to the fingers and particularly the growth-plates of the skeletally immature can have long-term implications, so they need to be avoided. Because of this there are some specific guidelines which have been laid out by various bodies, including the UIAA, the BMC and certain experts in the field of training for young climbers. I’ve summarised my understanding of this below alongside other advice, but for a fuller understanding, I would absolutely recommend reading the “Should U18s use campus boards” article by Dr Volker Schoffl and Audrey Morrison on the BMC website (link below), as well as delving into the other references which go into more detail than the scope of this article. They should focus on a high volume of climbing, but shouldn’t have more than three hard sessions per week. Under 18s should spend less than 10% of their training time doing non-climbing based strength and power exercises, with a focus on developing non-specific power in the shoulders and core. They should not be using campus boarding, added-weight fingerboarding or negative eccentric training for strength training. Under 18s should avoid repeatedly trying high intensity moves such as steep bouldering with small hand holds or using a systems board. Instead, the focus should be on technically challenging problems. Importantly, under 18s should avoid using a ‘crimp’ type hand position when climbing. Instead they should be trained to be strong in an open hand position, which puts a lot less stress on their finger structures. Particularly during growth spurts between the ages of 12-16 years, youngsters are at the greatest risk of over-use injuries, so parents should keep track of height and weight and inform coaches when they see an acceleration in either. Climbing shoes should fit comfortably, and be checked and replaced regularly, as the growing bones in children’s feet shouldn’t be forced into extremely tight shoes. Despite following sensible training advice, warming up and being mindful, small tweaks, strains and sprains can and will happen. The best athletes out there in any sport will have had their fair-share of injury, and the most successful are those that manage and deal with these quickly and appropriately, limiting the impact that the injury has on their training schedule. For under 18s, any aches and pains should be identified quickly and coaches should be informed, to allow them to adjust the individuals programme appropriately. Any injury involving trauma and/or persistent pain or swelling should be examined by a trained and suitably experienced health care professional. In the case of finger injuries, any child with non-traumatic finger pain should take a week off climbing. If it persists, then they need to urgently see their GP and arrange an x-ray to exclude the presence of a stress fracture or growth-plate injury. If in doubt, get it checked! As a Physiotherapist specialising in climbing and sports injuries I’m qualified and experienced in assessing and diagnosing a huge range of injuries. I have also built up a network of contacts, from professional climbing coaches and other climbing physiotherapists, to finger surgeons and radiographers. As a service that supports the climbing community based around Redpoint Bristol I’m more than happy to receive questions relating to climbing injuries, so if you have any questions about the above information or want some advice about an injury then don’t hesitate to get in touch. MCSP, HCPC registered, BSc Hons, UCAPD level 4. The RISE nest has almost landed! We are very excited to announce that Rise Physiotherapy and Pilates is going to be a permanent fixture within Redpoint Bristol Climbing Centre. So here we go; why do Pilates? Is Pilates like Yoga? Is it just for Women? Why should climbers do Pilates? These pretty much sum up the types of question I get asked on a regular basis about Pilates. Lets start from the beginning, what is it? Pilates is a type of physical activity which aims to strengthen the body in an even, systematic way, with particular emphasis on core strength to improve general fitness and wellbeing. Pilates exercises are done on a mat, using body weight, or using special equipment, such as the Reformer. With its system ofpulleys and springs, handles and straps, the apparatus can provide either resistance or support, depending on your needs and goals. 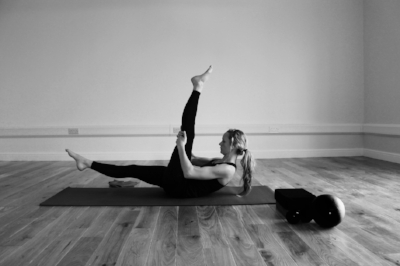 Pilates was developed by German-born Joseph Pilates (A MAN!) Who believed mental and physical health were closely connected. His method was influenced by western forms of exercise, including gymnastics, boxing and Greco-Roman wrestling, so there you have it. So that gives you a little insight into what the word means. It’s a functional way of exercising through a pattern of movements to strengthen the core, back, shoulders and every other body part you have. After your first class you’ll feel it in places you never knew existed! As for “is it like Yoga?” Well, it can be very different, but is similar in certain aspects. Pilates is based upon strength training methods, so the format focuses on repetitions of exercises using either equipment or your own body weight. It's a mind, body experience and breath control is an essential element, but with a less spiritual focus.Whilst there is lots of focus on flexibility, the key goal is postural awareness, endurance and movement control. So it’s definitely NOT just for women. It was designed by a bulky German guy to rehab soliders injured in WW2. All of the people I train discover things about their posture, body-type, strengths and weaknesses. This brings me nicely on to why Climbers should be incorporating Pilates into their weekly training programme. Climbers need body tension, shoulder and scapula stability, hip flexibility and control, and upper back mobility. In an hour long Pilates group class you will learn a range of exercises to enhance and strengthen your climbing practice, so no more monkey posture. Lets finish with why some people perceive Pilates to be ‘only’ a moderate form of exercise. Well, in a nutshell it isn't a high-intensity, strenuous form of physical activity because the whole principle of pilates is designed around precise strengthening and rehabilitation of the body, control and quality of movement. It is used worldwide by athletes, particularly gymnasts and dancers, and has an excellent reputation with those struggling with low back pain. There’s no thrashing around with dumbbells until you pass out, no flailing burpees until you’re purple, but if you want better posture, strength and precise body control then you should give it a go. The results will speak for themselves. Thanks for reading and hope to see you in class at Redpoint fitness soon!